The Port of Rome project by Centro Studi Airone gives tourist and practical information on Civitavecchia and the towns nearby to those who stay in town for a short time. These information channels through this internet website www.portofrome.it and in the totem, internet machines located inside the passenger terminal in the port. 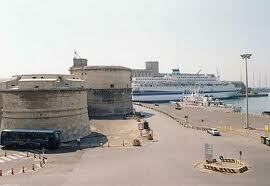 Since 2000 years, Civitavecchia is considered Romeâs the way to the sea. Nave al Porto di Civitavecchia Thanks to its strategic location, just 60 km from Rome and positioned in the heart of the Etruria Region, Civitavecchia has become the main port with massive national and international cruise tourism. In 2003 the Sea Highways have been inaugurated and traffic to Sicily and Spain has been even more intensified hence. In 2004 the local Harbour Authority has signed an agreement with Costa Crociere, Royal Caribbean and MSC, leading Companies in the cruise market. Thanks to this agreement and to many building works done in the harbor, the port of Civitavecchia has become the major port in Italy and the second port in Europe, after Barcelona. According to the data broadcasted by the Harbor Authority, passenger traffic has grown 143% in 2005. Only in 2004 cruise passengers in Civitavecchia have been 680.000, more than 1 million passengers in 2005, thanks also to investments done by Royals Caribbean and MSC. Because of the massive portâs growth, we decided that it was necessary to create informative channels to let tourists know about the opportunities and the work of arts of our town. The multimedia totem are very useful and easy to access. They have a touch-screen system and the same information you can find in the www.portofrome.it website. They are translated in five different languages to allow all tourists of different nationalities to use it.